I scream, you scream, why is everybody screaming about ice cream? A Canadian ice cream company has begun to establish branches in the United States. Normally that news would make most residents of the lower 48 jump for joy. But, in this case, the name of the company has already caused quite a ruckus before most of the shop doors have even had a chance to open. The company’s name just happens to be “Sweet Jesus” and for some ice cream lovers, that onomastic choice is just too much to take. Other religiously-inspired food names are far from unusual. Aside from culinary favorites like Angel and Devil’s Food Cake, St. Lucia Buns, Hot Cross Buns, and good old fashioned Easter eggs, there are a number of companies that have taken their inspiration from Christianity when developing their business moniker. 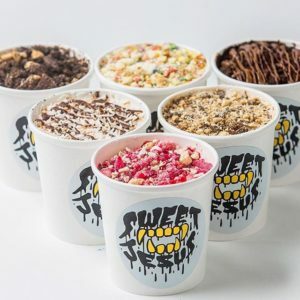 According to the owners of the Sweet Jesus ice cream chain, they have no plans to change their company name anytime soon. ← Does a “burger” have to be made of meat?